As I was rereading my last post, I decided that I should share a bit of my wife's story with you. My wife is fast. She has always been fast. In elementary school she knew she was fast because she usually beat all of the boys. Since before she started running track in middle school, she dreamed of making an Olympic team. 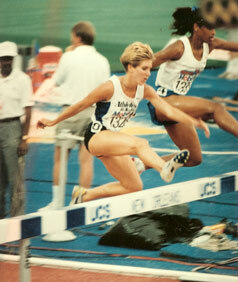 The picture you see here is Gina in the 1992 Olympic trials in the women's Steeplechase. She won! Shortly after this picture was taken she broke the tape to win the Olympic trials and became 1992 US National Champion in the Women's 2000m Steeplechase. She then ran a victory lap with the American Flag and signed autographs. What most people did not know, however, was that she was not actually going to the Olympics. The event she had just won was only an exhibition event, since the women's Steeplechase was not yet an Olympic event (is has been an Olympic event for men for years). She qualified to fulfill her life-long dream but did not have an event to run in the Olympics. She did win the National Championship again in 1994 and got to compete for the US team in the Goodwill Games in St Petersburg, Russia. Well, 16 years and 4 children later the Women's Steeplechase is becoming an Olympic event in 2008. She is still fast and has the will to push herself beyond what the normal human mind can imagine. Did I mention her pushing a double baby jogger (actually a cheap knock off with square wheels and rusty bearings) 10 miles regularly at a 7:30 pace in 96 degree heat. I know the likelihood of a 40 year old mother of 4 coming back to compete in the Olympics is next to impossible but my God is a God of impossibilities. I have no doubt in the world that she would compete and win! It's great to hear your story, Gina! I knew most of it, but not all..You're awesome and it is personally thrilling to have ever run with you! (not at YOUR pace, of course!!!) Even better to know the heart behind those fast legs. You go, girl!